Fr. John talks about St. John the Theologian and the importance of connecting and loving each other. Fr. 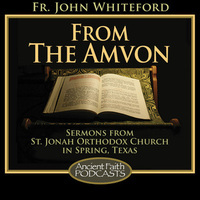 John shares from the life of St. Mary of Egypt. Fr. John continues his series on the Sixth Commandment. Fr. John shares his homily on the Sixth Commandment. Fr. John talks about our Christian response to current events. In recent weeks, we’ve heard a lot of talk about hate. Those who disagree with the gay marriage decision of the Supreme Court have routinely been called haters by those that are celebrating that decision. And, on the other hand, we’ve recently had a racist who, in South Carolina, went to a black church and killed nine people because he hated black people, and he said he wanted to start a race war. What is the Significance of the Feast of the New Martyrs of Russia? Fr. John shares stories of martyrdom and encourages us to prepare for our own. In the Gospel reading which we’ve just heard, Christ prayed, “Holy Father, keep through thine own name those whom thou hast given me, that they may be one, as we are.” (John 17:11) What does it mean for Christians to be “one”, and what, exactly, was Christ praying for? Fr. John shares his homily from the Sunday of Orthodoxy.